PE at St Weonards Primary School develops the children’s knowledge, skills and understanding, so they can perform with increasing competence and confidence in a range of physical activities. These include dance, games, gymnastics, swimming, athletics and outdoor adventurous activities. St Weonards Primary School has a number of school / club links. Subsequently the children will get the chance to work alongside a number of specialist coaches sports coaches from the RFU, FA and ECB. All children at St Weonards Primary School have the opportunity to take part in a range on extra curricular PE activities. There are weekly after clubs as well as regular inter-house competitions that take place during lunch times. The children will also get opportunities to compete in several HMFA tournaments including Hockey, Netball, Tag Rugby, Football, Gymnastics, Tennis, Cricket and Athletics. In addition to this they will also compete against other Herefordshire schools at the Winter and Summer School Games and at the Hereford Swimming Gala. 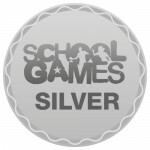 Last year our school achieved the Bronze Sainsbury’s School Sports Award and we intend to raise that to Silver next year.